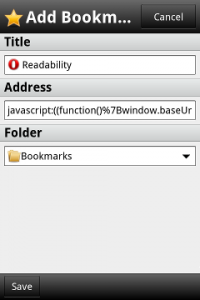 So you want Readability bookmarklets on your Android device, huh? Not so fast! At the time of writing, it’s not possible to access the official Readability bookmarklets on Android but there is a workaround. Here’s how to do it in three easy steps. Open the Bookmarks menu and click on the Add button (don’t click Save yet). Change the title to Readability (or something similar). Delete the address and paste in the code copied from above. Voila! You should now be able to go to any article or blog post, click the Readability bookmarklet and enjoy a better reading experience. This entry was posted in Other and tagged Android, howto, mobile, Opera, tools, Web on 5 April, 2012 by Daniel.